In need of an easy and cheesy hostess gift? 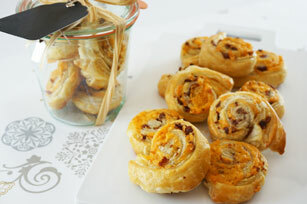 Try these Easy Cheddar and Bacon Pinwheels. Cheddar cheese and crumbled cooked bacon are rolled up in puff pastry for super-simple appetizers. Unroll pastry on lightly floured surface. Sprinkle with bacon and cheese to within 1/4 inch of one short side; roll up, starting at opposite short side. Place, seam side down, on parchment-covered baking sheet. Freeze 15 min. or until firm. Transfer to cutting board; cut into 1-inch-thick slices. Place, cut sides up, on prepared baking sheet; brush with egg. Bake 17 to 20 min. or until golden brown. Cool 1 min. Remove to wire rack; cool completely. Chop 2 slices (40 g) Black Forest ham; use instead of the crumbled cooked bacon. For more flavour, add 1/4 cup finely chopped red onions to the pastry filling.